Universal Advisor. It works as a scalper and dynamic order grid. Applies levels of stop orders, stop loss, take profit and trailing stop that are invisible to the broker. 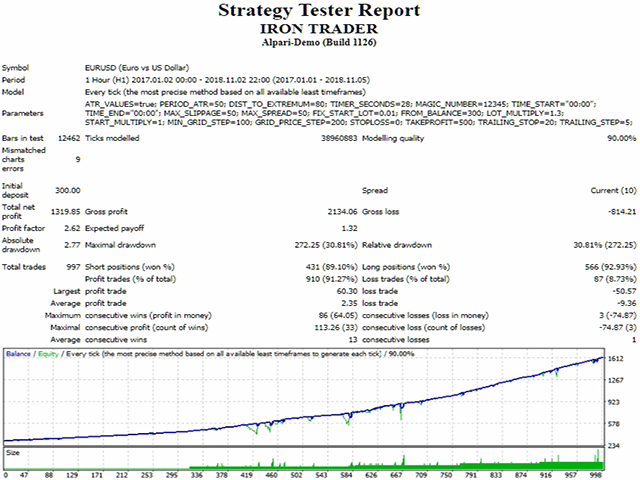 Level values ​​can be specified in pips or percent of average price volatility (ATR). It can work at a specified time, has protection against slipping and expansion of the spread. The graph displays information about the quality of execution of orders, profits and current open positions (the number of orders, the number of lots and profit). Suitable for working with any brokers, including American brokers with the requirement of FIFO. Starting lot will be = 0.03. Starting lot will be = 0.01. When the price passes 300 (MIN_GRID_STEP + GRID_PRICE_STEP) pips in the opposite direction from the last open order, the virtual level of the STOP order will be established - the price of the last open order +/- MIN_GRID_STEP. The order will open at the set level, but if the price continues moving in the opposite direction by N pips (MIN_GRID_STEP + GRID_PRICE_STEP), the level of the STOP order will change - the price of the last level is +/- MIN_GRID_STEP pips. The order lot will start to increase from the N order (START_MULTIPLY). The 1st order with lot 0.1 is opened, the 2nd order will also be opened with lot 0.1, and the 3rd order already with lot 0.15. And starting with N orders (START_MULTIPLY) the lot will increase by LOT_MULTIPLY. The last lot multiplied by START_MULTIPLY. The Expert Advisor sets the levels at N distance (DIST_TO_OPEN) from the Ask / Bid price, which, when touched, opens the first trade. Levels are modified by timer TIMER_SECONDS. If for the allotted time the price failed to break through the specified level, then they are modified at the new prices. Up to now it's very good! Идея интересная,на тестере результат превосходный.Дальше дело за оптимизацией и демо.Тогда и смогу дать реальную оценку. А вот сам Владимир , автор этой и других работ, человек порядочный и надежный . В этом у меня нет никаких сомнений . super!! hat den Backtest bestanden, jetzt auf real Konto- hier ist der link um es zu sehen. Tested EA in demo. See back test results (99% quality) in comments section. Do not use in live account. EA needs improvement like news filter for current pair or spread control during news events. After testing in demo. I can confirm it is not profitable. Do not use my M5 set files on any live account. Current version 1.4 cannot be optimized. I am giving 2 stars for developer's efforts. looking at the Forwarding DEMO. En marcha la prueba del set1 ,de momento pinta bien ,en el comentario 5 dejo una captura de pantalla .